I need, I need, I need! Gimme, Gimme, Gimme! Her children rise and call her blessed. 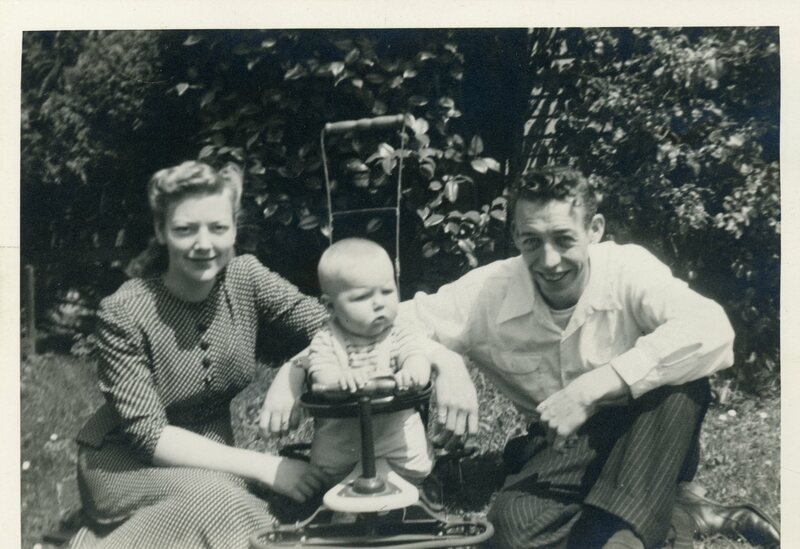 My mom passed away just four days shy of her 67th Mother’s Day. She was 88 and she was a saint. If you have read any of my stories about my dad, you will know that no truer words were ever spoken. It might seem odd, but I like to read obituaries. They are sobering and give one perspective on how tenuous life really is. Rarely are they ever completely truthful or give the entire story about what kind of person the deceased really was. In every obituary the deceased family member was loved by everyone, loved life, always had a ready smile and never got angry. Invariably, the person will be missed by every single person who knew him or her. It’s just what you do when you remember someone. You accentuate the best and forget the rest. It’s a delicate balance and absolutely to be expected. However, there is no delicate balance with my mom. This is the honest truth – she was a saint. She lived the last years of her life in a community of retired people (the last eight years in a nursing home) and outlived most of them. Few of her friends are left to remember her. But, her kids remember. I would like you to meet my mom. Gertrude Lorraine Bentley was born in 1926. 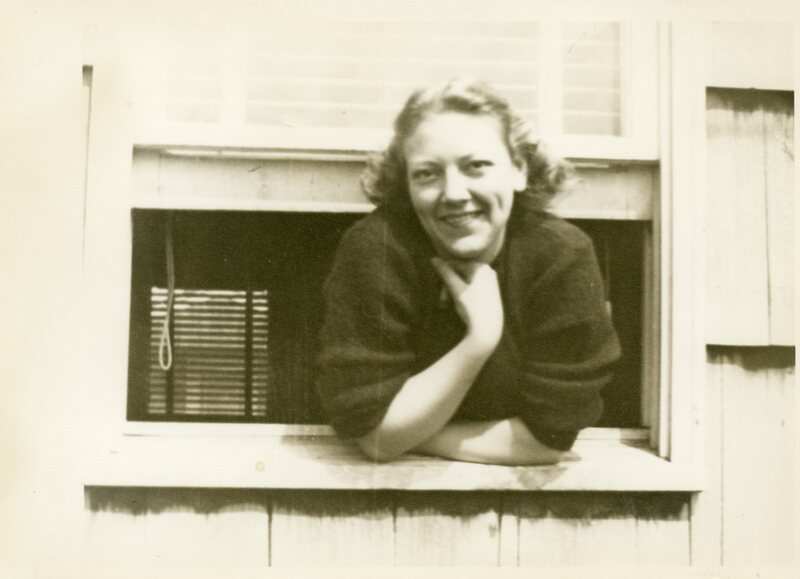 I don’t know much about her life because she never really talked about it, and I never asked, but what I’ve pieced together is that she was born into a migrant farm family that moved west during the Depression. They were a family of dusty, fruit-pickers out of The Grapes of Wrath. Her home life wasn’t ideal: her father drank and her mother slept at a friend’s house because of it. Mom was a teenager when she and Dad met. They were polar opposites and I can only assume that he swept her off her feet with his enormous personality. He must have seemed like the brass ring in an otherwise mundane merry-go-round. By the time I heard the stories of my dad getting into knife fights and brawls at bars with his then pregnant wife (my mother) in the fray, I couldn’t imagine it. This woman with graying hair, who loved nothing more than to sit and read James Herriot novels and drink coffee or play endless games of cribbage with her son, didn’t seem capable of wanting to smoke cigarettes, while sitting in a bar watching her husband fight. All I can imagine is that he must have seemed like an amusement ride compared to the life she previously led. She must have seemed like a breath of fresh air to my dad. I met her when she was 38. I had just been born and from everything I pieced together later in life, I was a huge accident. But in her mind, I was not a mistake. She told me one time that even though Dad was really, really mad about her being pregnant (why he would be mad when he had a part in the process is beyond me) her arms ached to hold me. It truly is all any child can ask of a mother – to be loved so much that her arms ached if you weren’t in them. I remember bits and pieces of my childhood. I remember helping her make cookies. I remember Swedish pancakes with powdered sugar and lemon juice squeezed out of a plastic lemon. I remember one-eyed Egyptian eggs. I remember sitting with her in a rocker. I remember the squeaky sound of her cleaning our huge picture windows and walking up and down Madison Avenue with her lifting my arm up so I wouldn’t trip going over the curb. I can only see dimly the moments of her caring for my needs, but I am left with a vivid and overwhelming sense, like a technicolor hand-crocheted afghan, of how much she liked me. Most kids know that their parents love them. It is an entirely different thing to know that your parents like you. I know that my mom liked me. This is especially telling because in my mind I wasn’t a particularly likeable kid. What an amazing thing for me to come home from school knowing that even though I may have had a really, really bad day, there was someone at home who couldn’t wait to see me and actually liked being around me. She was my refuge and there is no greater blessing than that for a kid. There are life lessons to be learned from my mother if we are wise enough to listen. She never read any books on how to raise children. She was permissive in her parenting, she never physically disciplined me, she was a good cook, but still allowed me to eat all the things that weren’t good for me, and she was virtually incapable of helping me or my siblings get through those awkward years where you don’t know why your feet are suddenly huge or why funny bumps are breaking out all over your face. But, the one thing she was capable of doing she did in spades – she loved us. Her love seemed to erase all the things she wasn’t able to do otherwise and it had a profound impact on all of us. Her children have risen up because of it and called her blessed. I never heard a single complaint about having to take care of any of us, and, in all my years, I never heard her say a harsh thing about me or any of my siblings. She just didn’t have it in her. She built up her children and never tore them down. She worked tirelessly to make sure we were well fed and clothed and had what we needed. Mom was happy being at home. Dad wasn’t. He always wanted to be doing something. She wasn’t particularly fond of going places, but she went. If we picnicked, she packed, cooked and cleaned up when we got home. If we fished, she processed the fish. If we clammed, she cleaned them all. If we crabbed, she cooked them. She held our coats when we got hot and our shopping bags if we didn’t want carry them. There were times she was so overloaded that she looked like a Sherpa going up Mount Everest. She bandaged my cuts and washed my wounds. She watched over the treasures that I found on the beach so no one would take them. I took great advantage of her kindness, but that was Mom. She gave and gave, but never required anything in return. She was a saint. Yes, that’s a football. Yes, I did share my sister’s room for years. She spent her entire life putting her children first. Her arms ached to hold me as a baby, but her arms ached to hold all her kids. All of her children have the same sense of kindness and affection towards her that was gained when she rocked us to sleep as children or read to us when she put us to bed. She wasn’t the smartest or the prettiest (though she was both smart and pretty), but she loved us unconditionally. This love kept me from doing some really stupid things as I grew up. In my world, the worst thing I could do was hurt my mom and the first thought that came into my head when I was tempted to do something stupid was, how will this make mom feel? I feared disobeying my dad. I felt self-loathing when I did something to hurt my mom. She only raised her hand against me one time. I don’t remember the exact circumstance, but to have done something bad enough to bring her to violence against one of her children, it must have been something really, really irritating. She swatted me on my fully clothed back end as I ran by her and I cried. It did not hurt even a single bit, but knowing that I had done something to her that made her get angry at me was enough to break me down. In my world it was a turning point and it never happened again. Some might say that she was living vicariously through her children and I wouldn’t be surprised if she was (living with Earl made us all want to live a different life somehow), but mostly she wanted to see her children happy. She didn’t have much power because of my dad, but what power she did have – the power to love us – she used to great advantage in our lives. There are turning points in a family’s history that mark a drastic change in that family. Mom was that turning point in our family. In fact, because of her, our family tree grew an entirely new branch. Most of my dad’s relatives were cut from a different mold and, how do I say this delicately, a bit rougher around the edges. 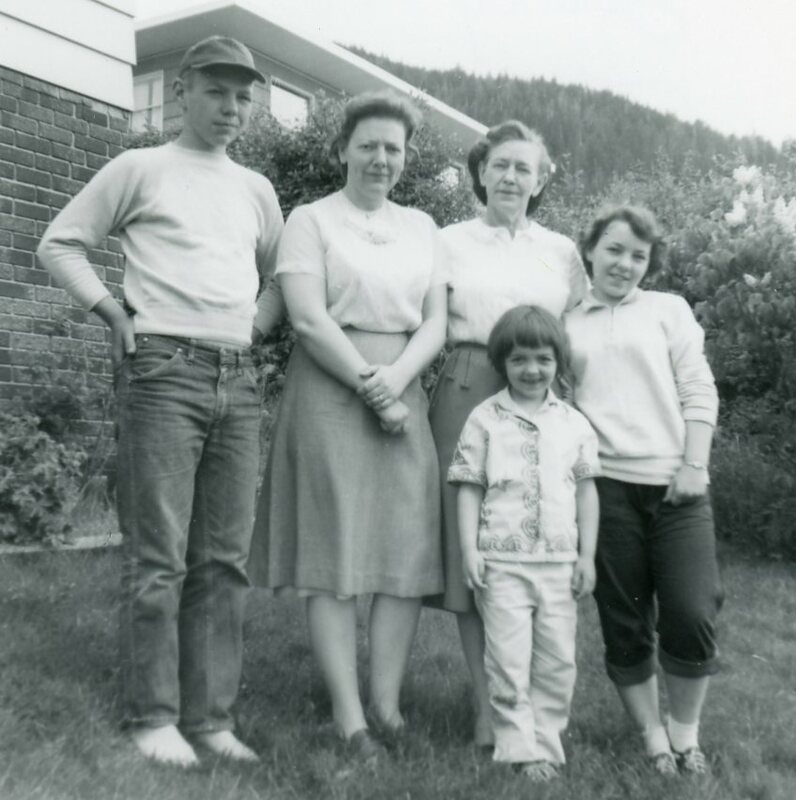 Had we been left alone with Dad, or Dad and the kind of woman that notoriously marry men like my dad, I know things probably would have turned out markedly different in all of our lives – think orange jumpsuits and not being able to vote. Mom saved us in so many ways. 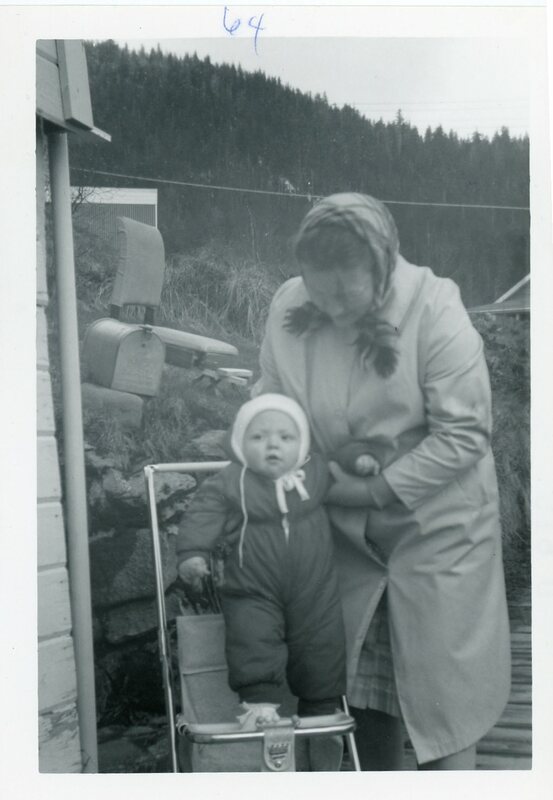 When I got married and had kids of my own I realized exactly how difficult it is to be kind and patient all the time (let me say impossible) and I always marveled at how easy my mother made it seem. 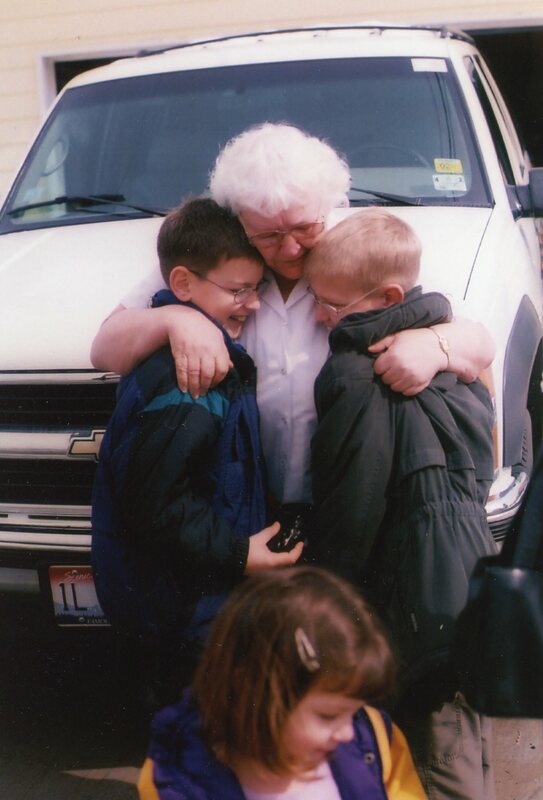 All my kids got to know their Grandma Dudie, but my boys got to know her the best. 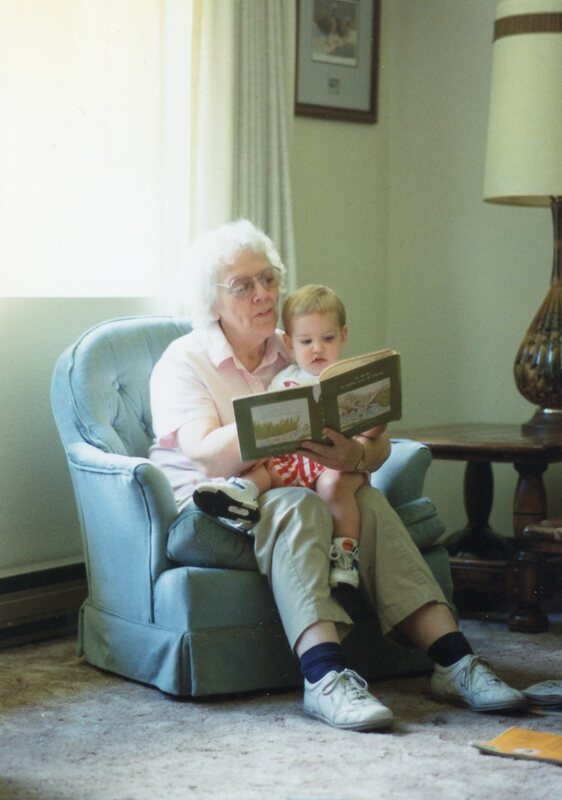 She would sit for hours with them playing checkers or cards or listening to them tell stories or reading them books. I could only take a few minutes of any of this, but she was content to just sit and be with them. 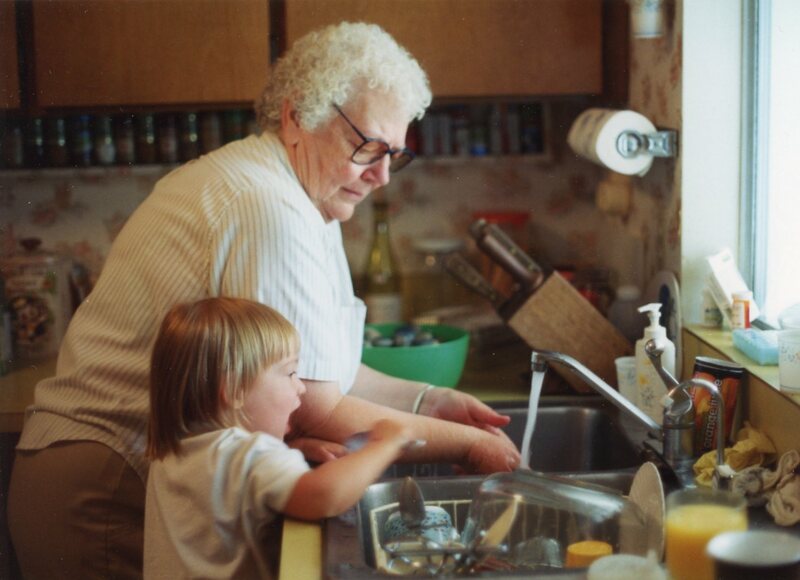 My girls didn’t get as many quality years with her before Alzheimer’s took her mind, but she loved them like she loved me even in her affliction. I know her arms ached for them, too. As we all got older, the times together as a family became less frequent, but when we were together Mom was still the buffer. Dad would be unreasonable and demanding and she would deal with him and then come back to the game we were playing at the dining room table. I can still see her in my mind laughing uncontrollably over some silly inside joke. 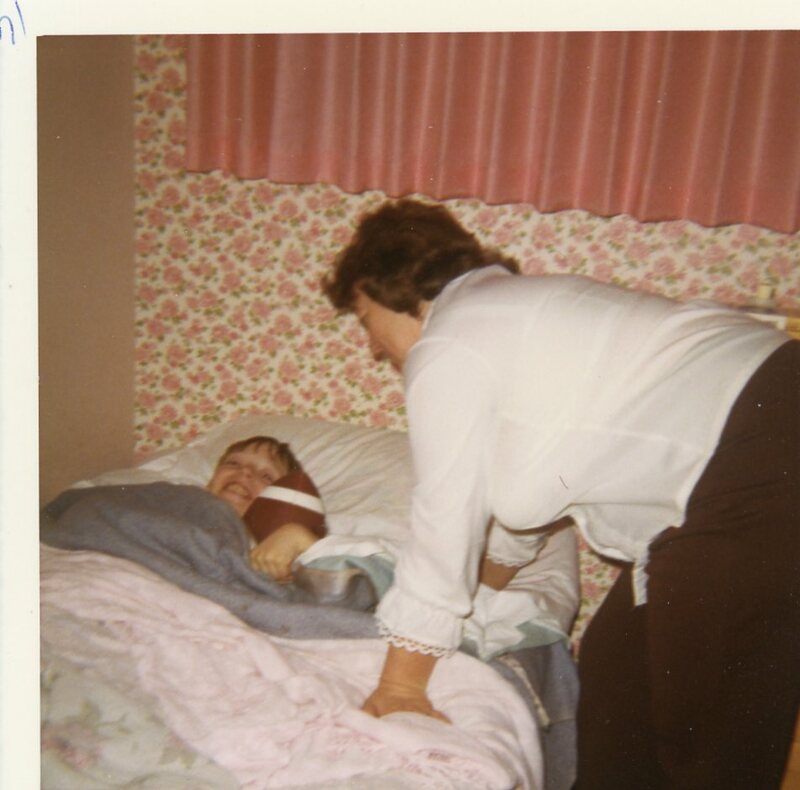 It was a constant goal to get mom going and when she did, we all laughed until we couldn’t breathe. These were the best of times and the worst of times. Even as Alzheimer’s took her mind from her, she was still sweet and she was still the buffer that kept us from the full force of Dad. She wasn’t quite as sweet to him as she used to be and was finally able to stand up for herself (we were all secretly a bit happy about this) as the filters dropped from her mind. But to her kids, she was still the same. Even though she forgot things and asked the same questions over and over, her love for us still shone in her eyes and to the very end she was still one of the nicest people any of us had ever known. Dad died three years ago and there was a huge sigh of relief from his kids. I know that’s a terrible thing to say, but he was a trial and when Mom went to the nursing home eight years ago, the buffer was gone and we got the unfiltered, crack cocaine version of Dad. Alzheimer’s is a terrible thing. It was made even more terrible for us because it took the parent that we all wanted to have around longer and sidestepped the one that made life difficult. The one who wanted nothing more than to sit and enjoy her children was taken away far too early. It’s sad, but there it is. Now she has passed. As we drove to be with her during her last moments I wondered what one was supposed to do when sitting with a dying parent. I now have a role model to emulate. My sister Betty was by her side and did the most beautiful thing. She sat next to her, held her hand and talked about what a great mother she was and spoke the names of her kids and grandkids as she breathed her last. What was most important to my mom in life was whispered in her ear at her death. I am thankful that she was my mom and sad that her life is over, but at the same time I am happy and relieved for her to finally be free. 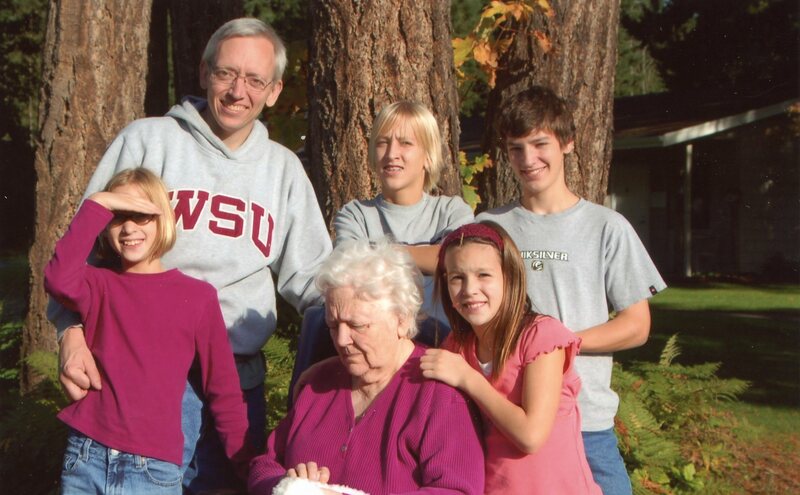 Her children, grandchildren and great-grandchildren are her legacy. Well done, Mom.